As we age we reduce the amount of collagen that we produce and the skin becomes saggy. This starts from our early 30s and, for women, becomes considerably worse after the menopause. Added to this sun exposure, stress, smoking, alcohol and processed foods all increase the breakdown of collagen in the skin. The melanocytes, the pigment producing cells in the skin, also gets damaged over the years, especially by sun exposure and pigment spots appear on the skin. This loss of uniformity of the skin adds to the aged appearance. As we get older it is also harder to stimulate the skin to produce collagen so we need to have effective treatments that not only stimulate collagen production but deliver the ‘building blocks’ and other stimulatory products to the level in the skin where they are most needed. The Nanopore Micro-needling device is the next generation after Dermaroller and Dermapen. Treatment causes active ingredients to penetrate deeper layers of the skin and maximize collagen stimulation. Very quick treatments and long-lasting results, no downtime, no post-treatment pain. The redness on the face often subsides within a few hours. If it persists mineral makeup can be used. Depending on the strength of the products used after the treatment there may be peeling for up to a week. For this treatment, we use special solutions developed by dermatological and pharmaceutical specialist Dr Serrano. 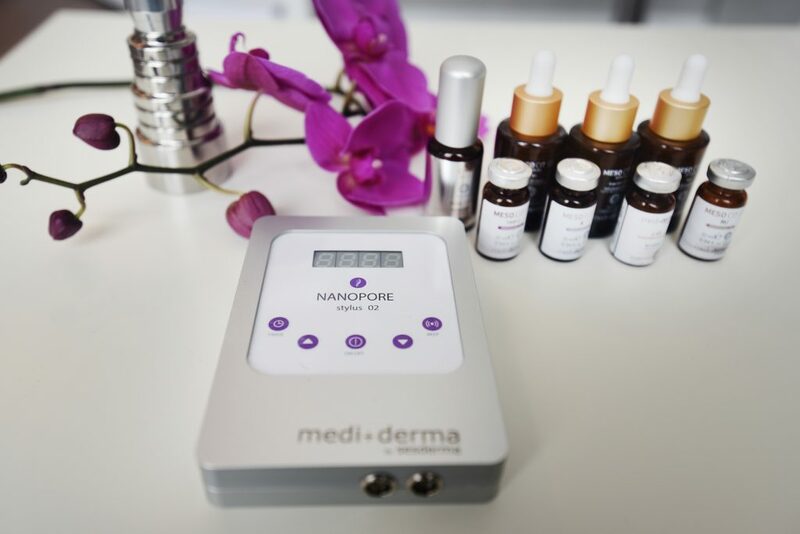 The revolutionary nano-technology uses ‘encapsulated’ active ingredients such as Retinol, Epidermal Growth Factor, Collagen, Vitamin C, Hyaluronic acid, which allows it to penetrate deeper into the skin. Because of the nano effect this is the equivalent of using ten times the strength of the active ingredient working where it is most needed beneath the skin, yet without the aggressive side effects on the skin surface. What Nanopore can be treat? Wrinkles, photoaging, large pores, pigmentation, sagging skin, acne scars, cellulite, stretch marks and scarring.